Right. Without reselling them it was going to be called Viva Health something...Field, Stadium, etc. I hope new renderings look less amateurish. To spend this much money, in such a highly visible location, it would be a crime to plunk down something as ugly and archaic looking as presented thus far. Instead of shrinking one side, how about the opposite approach of making in possible to televise from any area of the stadium? That's all well and good but broadcasters don't like it and photos taken from the press box side look bad at non televised games. I'll be happy for a new stadium people said would never happen. Nothing worse than 30K people in the stadium and a photo taken at an angle with no one in the picture. Perception is often reality with the gullible public. I know this may be a way early question but I wonder if there will be an RV area? Like to get one of those pretty soon. With this new BJCC stadium, UAB will be able to legally sell prime location (50 yd line sections) season tickets in advance for the first time in its football history. It will also be able to charge a premium "contribution" to buy them. I would expect this contribution to be in line with similar courtside seating at Bartow Arena. I am hopeful this new stadium will offer great improvements in fan desired amenities like comfortable seating, better concessions and better equipped restrooms. I would like to see escalators, elevators and hand rails to aid the mobility challenged. Other items have been mentioned from time to time (see post #44 above) and would be welcomed by Blazer fans who have waited so long for this to happen. (04-11-2019 12:07 PM)BlazerGreen Wrote: I know this may be a way early question but I wonder if there will be an RV area? Like to get one of those pretty soon. I'm curious about tailgating too. Hopefully they'll have an area for people to purchase tailgate spots (regular spots, not just premium) like they do now. (04-11-2019 12:15 PM)BAMANBLAZERFAN Wrote: With this new BJCC stadium, UAB will be able to legally sell prime location (50 yd line sections) season tickets in advance for the first time in its football history. It will also be able to charge a premium "contribution" to buy them. The premium contributions normally get you a box seat. Not enough of these premium contributions to filter down to the commoner seats yet. (04-11-2019 12:15 PM)BAMANBLAZERFAN Wrote: With this new BJCC stadium, UAB will be able to legally sell prime location (50 yd line sections) season tickets in advance for the first time in its football history. It will also be able to charge a premium "contribution" to buy them. I would expect this contribution to be in line with similar courtside seating at Bartow Arena. Are we certain stadium certificates don't carry over to the new stadium??? Awesome! $1M/yr for 15 years. I know UAB guaranteed a certain amount for naming rights ($400k I believe). Does that mean the difference goes to UAB rather than general stadium financing? 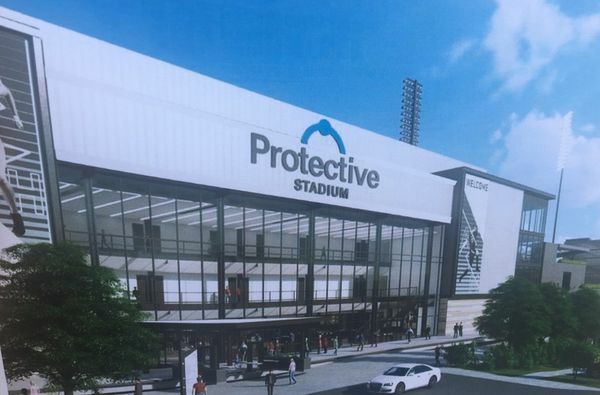 For those of you that can't get through the Pay wall... the stadium will be known as Protective Stadium. Tear down Carraway and you all of a sudden have room. Regions and Alabama Power both also signed secondary marketing agreeements for the stadium for $500,000 per year / 10 years each. Lord I hope so. Hope you find the one you want. I had to drive to Ohio to get the one I wanted. "What Stephens feels more comfortable in saying is that the stadium will be ready for UAB football, Fall of 2021." (04-11-2019 04:37 PM)blazerjay Wrote: Regions and Alabama Power both also signed secondary marketing agreeements for the stadium for $500,000 per year / 10 years each. So I guess that covers $25m of our $40m ($4m per for 10 years) commitment. I assume there will be additional sponsorship opportunities. Maybe we can cover it all beforehand, so our increase in stadium revenues (boxes, concessions) can add to our budget rather than paying our commitment. I have seen conflicting numbers on how many the stadium seats. How many will this stadium seat? Is it 40,000 or so or 55,000 seats as mentioned in some articles? (04-12-2019 08:38 AM)the_blazerman Wrote: I have seen conflicting numbers on how many the stadium seats. I thought it was 45k with the ability to add temporary seating up to 55k.